Vishal Bharadwaj wrapped up ‘Shakespeare Trilogy’, his laudable and ambitious adaptation of the Bard’s plays to Indian settings and contexts, which also comprised Maqbool (Macbeth) and Omkara (Othello), with Haider. Based on Hamlet and set in the violent political turbulence of Kashmir which had reached a bristling crescendo during the 90s, this dark, brooding, edgy, nihilistic and gripping film very well traversed the political and the personal threads of the tragic tale while emphasizing upon a number of key elements like revenge, jealousy, lust and a complex mother-son relationship with subterranean guilt arising out of Oedipus Complex. 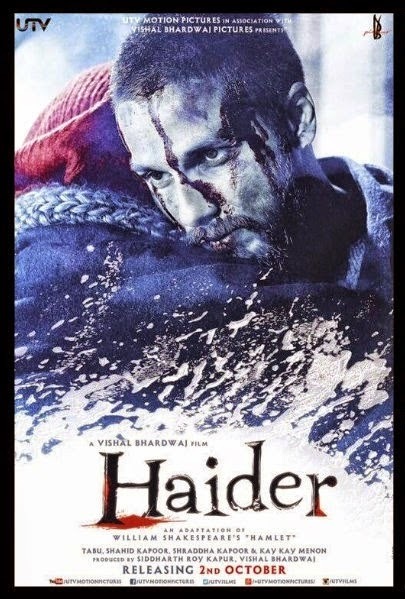 When his doctor father (Narendra Jha) gets arrested by the army on charges of sedition for housing a separatist leader, and is made to disappear without trial, his son Haider (Shahid Kapoor), a university student, returns to Kashmir in search of him. Upon returning he realizes that his mother Ghazala (Tabu), instead of grieving for her missing husband as he’d anticipated, is embroiled in a relationship with his paternal uncle Khurram (Kay Kay Menon), a sly and unctuous wannabe politician who’s hand in glove with his journalist fiancée Arshia’s (Shraddha Kapoor) father who’s in the army. Meanwhile Roohdar (Irrfan Khan), a wanted man involved in the freedom struggle, reveals Khurram's role in getting his father caught, which sparks obsessive desire for revenge in him, and propels his mental disintegration and the eventual carnage. Hauntingly scored, atmospherically photographed and brilliantly enacted, the film expertly portrayed the violence and political quagmire the war ravaged Valley is entrapped in, and showed the nefarious and draconian means employed by state machinery for subverting the popular uprising, while chronicling a compelling personal story in the process.